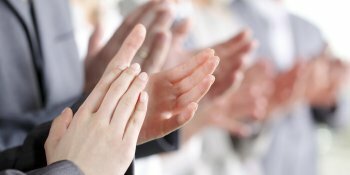 Get a standing ovation with a great presentation. Ever been to a really bad presentation? You know, the kind where the speaker stands behind the podium, uses slides that mirror what he is saying directly, and includes lots of data tables to validate his position. But. "What's so bad about that?" you ask. "Isn't that how most presentations are given?" Yes. That is how most presentations are delivered, but that doesn't mean that's the most effective way to deliver them. This kind of presentation risks boring your audience to the point where they start wishing for a fire alarm to go off so they can escape. And once you lose someone, it is next to impossible to bring her attention back. If the information you are presenting is important enough for you to deliver orally, then it demands an appropriate amount of planning and preparation so that the information you present is memorable – for the right reasons. Give a bad presentation and you'll be remembered all right: it just won't be the type of impression you want to leave in anyone's mind. When someone presents well, it sends the message that the person is capable, confident, intelligent, and competent. These people get noticed and that type of attention bodes well for your career. Even if you don't make formal presentations in your current position, think about the future and keep in mind that you do have to present your ideas and opinions on a daily basis. The same basic principles of effective delivery apply.